Prepared by James Dill, Frank Drummond, and David Yarborough, The University of Maine, Orono, ME 04469. All photographs taken by James Dill. Original prepared by J. Dill, H. W. Forsythe and A. A. Ismail in 1982 as Cooperative Extension Service Fact Sheet No. 201. Revised February 2001. 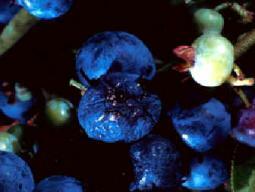 The blueberry maggot, or blueberry fruit fly, is the major insect pest of blueberries in Maine. The first flies (Figure 1) begin to emerge from the soil in late June or early July. The date of initial fly emergence is dependent upon soil temperature. Emergence will begin to take place in mid-June if spring temperatures have been very hot, but not until mid-July if spring temperatures have been unusually cool. Growers can estimate emergence if daily soil temperatures are measured (see Prediction of Emergence section in this fact sheet for more information). Flies continue to emerge until early August. After emerging, the flies, which live for about 30 days, and spend one to two weeks feeding on dew, insect honeydew, and secretions on foliage. During this nourishment period, adult females become sexually mature. It is believed that once flies are sexually mature they leave feeding sites and search for fruit. It is at this point that the flies colonize blueberry fields from the outside margins. Mating occurs on the fruit after which mated females seek out ripe blueberries in which to lay eggs. The females only lay a single egg in each fruit and each female can lay up to 100 eggs (infesting up to 100 fruit) in a period of 15 to 25 days. The female fly punctures the skin of the blueberry with a long pointed structure called an ovipositor which can be withdrawn into the insect’s abdomen. Once the ovipositor is in the berry, a single white elongate egg is deposited. The fly then drags the ovipositor over the surface of the berry leaving behind a chemical called an ovipositing deterring pheromone. This chemical deters other flies from laying an egg in the same berry for a few days. In seven to ten days the egg hatches and the larva (maggot) begins feeding. The first maggots appear in berries about mid-July. The full-grown larva is whitish in color, is about 7.75 mm (5/16 in.) long, round and pointed at one end and blunt at the other. As the larva feeds and grows, the berry begins to shrivel (Figure 2). After two or three weeks of feeding, the larva becomes full-grown (Figure 3), and the berry is almost completely destroyed. An infestation, if present, increases rapidly to a peak by approximately the second week of August. At this time, many of the larvae begin exiting the berries and dropping onto the soil. The larvae burrow into the soil to a depth of one to two inches to pupate. The insect spends the fall, winter, and following spring in the soil in this resting stage encased in a tough, brown outer skin called a puparium from which the adult emerges in early summer. In the first year after pupation, approximately 85 percent of the adult insects emerge. In the second year, roughly 10 percent emerged. In the third and fourth years, the remaining 5 percent of the flies emerge. This ensures the survival of the species. If a calamity should befall the population in any given year, some of the pupae would still be in the soil to emerge later. Figure 1. The first blueberry fruit flies begin to emerge from the soil in late June or early July. Figure 2. The full-grown larva is whitish in color, is about 7.75 mm (5/16 in.) long, round and pointed at one end and blunt at the other. Figure 3. After two or three weeks of feeding, the larva becomes full-grown and the berry is almost completely destroyed. Figure 4. The female has four white cross-bands. The male has only three white cross-bands. The female fly is about 4.75 mm (3/16 in.) in length with a wingspan of approximately 8 mm (1/3 in.). The female abdomen is pointed and black with four white cross-bands. 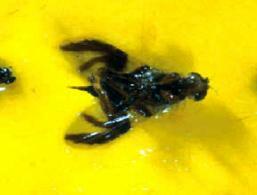 The thorax is basically black with a small, backward-pointing, white projection. The two large compound eyes are reddish. 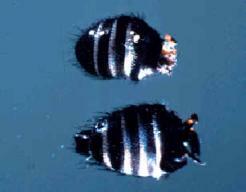 The male fly is somewhat smaller than the female and has a rounded abdomen with only three white cross-bands (Figure 4). The wings of both sexes are clear and are marked with characteristic black bands (Figure 5). Figure 5. There are three other species of fruit flies, including the black cherry fruit fly, the cherry fruit fly, and the Northern walnut husk fly that are found near the edges of blueberry fields in Maine (Figure 5) and that can end up on the traps used to monitor for blueberry maggot flies. Because these three species do not infest blueberries but are attracted to the blueberry maggot fly monitoring traps, it is very important to be able to distinguish blueberry maggot flies from these other species. These flies are distinguished by their wing patterns. The blueberry maggot has a continuous dark wing pattern. The black cherry fruit fly has a small, oval, clear spot in the wing and the cherry fruit fly’s dark wing pattern is not continuous. The Northern walnut husk fly’s wing pattern closely resembles that of the blueberry maggot fly. However, on close inspection, it can be seen that the walnut husk fly’s wing pattern is not continuous, but the outer edge of the wing is black. The Northern walnut husk fly is the least common in Maine, since its host, the black walnut, is uncommon. 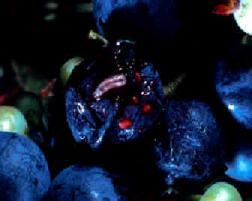 The blueberry maggot fly attacks both wild blueberries and cultivated blueberries. This insect has also been reared from huckleberry (Gaylussacia baccata), which may serve as an alternate host. 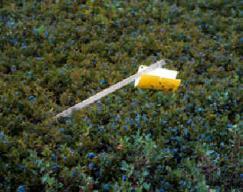 Yellow rectangles coated with sticky material and an attractive bait are used for monitoring the blueberry fruit fly. These rectangles can be made and painted by oneself or purchased pre-coated and baited. The pre-coated and baited traps are easier to use and are available from commercial suppliers. If you are interested in purchasing the traps, please see Great Lakes IPM catalog-Ready to Use Kits, Source for Pherocon AM Baited Trap. Tel: 989.268.5693, 989.268.5911, or 800.235.0285. It is thought that the flies perceive these yellow traps as extra large and attractive foliage covered with insect honeydew, plant sap, or bird excretions, and thus the traps mimic a feeding area for the flies. Also, an ammonium-based bait on the commercial traps aids in luring the flies to traps. Traps without the bait are not as attractive and will not be as effective in monitoring flies invading your field. If you are making your own traps be sure to purchase the ammonium bait to mix in with the sticky coating. Once the flies are attracted to the traps, they are caught in the sticky material (Figure 8). The traps should be suspended from stakes with the underside 4 to 6 inches above the tips of fruiting blueberry plants. To be most effective and consistent with the action thresholds indicated below, the yellow, rectangular traps should be placed in a position, with the yellow sticky surface directed downward (Figure 6 and Figure 7). Figure 7. Field trap made of coated sticky material. Figure 8. Fly caught in sticky field trap. Traps should be placed about 25 feet from the perimeter of the blueberry field, especially facing unmanaged blueberry areas. Put at least one trap into the interior of the field since some flies may emerge within the bearing field. The flies prefer protected areas; therefore, traps should be located one to two feet from bushes or thick patches of weeds. Weedy areas, with sweet fern or barrenberry, are good locations for trap placement. Use one trap per acre in fields under ten acres. In larger fields, a trap should be placed every few hundred feet along the border. This may figure out to be one trap every two or three acres, depending on the size of the field. There is no strict guideline as to the number of traps per field, but the more traps you set out in a field the less chance there is of missing a major infestation. Do not leave any large portions of your field edge without traps, especially those field edges adjacent to woodlands or pruned fields. The traps should be replaced every two to three weeks. The trapping surface will degrade as it gets covered with many insects or when the sticky surface becomes weathered. During trapping periods with abundant hard rains or extremely hot days, traps may have to be replaced more frequently (10-14 days). Therefore, three traps will be needed at each trap site to monitor the field throughout the season. Fly physiological development in the soil is determined by temperature, therefore, the expected date of initial, middle, and end of fly emergence can be predicted for a given area or field by measuring the daily average soil temperature starting on April 1st. The soil temperature has to be measured one inch below the soil surface. Temperature measuring devices, such as soil thermometers or automated soil temperature thermocouples wired to a waterproof data logger are available commercially. Please contact The University of Maine Cooperative Extension for sources. A computer program is available from Cooperative Extension that will make all the calculations given that you have collected daily soil temperatures and predict when expected emergence should occur. The program only runs on a computer with Windows 95 or higher operating system. The degree-days are calculated for each day starting April 1 and added to one another to arrive at the number of accumulated degree days since April 1. If the average temperature is less than the base (43º F) then the number of degree-days is 0 for that day. One keeps doing this until the number of degree-days totaled equals 971. The date when 971 degree-days are reached is when the middle of the fly population emergence is expected to occur. It is useful to be able to predict this date since you should have put your traps out at this point. The computer program will give you the date when the first fly is expected to emerge, this provides a better date for making sure that your traps will be out just before the flies begin to colonize fruit-bearing fields. The traps should be placed at the selected sites seven to ten days before anticipated fly emergence. Once the first fly is captured, the traps should be checked every three to four days. After checking a trap, record their numbers and then remove all blueberry fruit flies. If an average of six or more blueberry flies are found on all the traps in a field in a single visit or if an average of the cumulative total of ten flies or more are captured on all the traps in more than one visit, then a decision should be made to treat the field with an insecticide (see Wild Blueberry Fact Sheet No. 209). Remember that flies only lay eggs in ripe fruit. If thresholds are exceeded, but no fruit has ripened in the field, there is no immediate danger of fruit infestation. Monitoring blueberry fruit flies in individual fields can reveal the approximate time of their emergence. Monitoring information will also show the relative abundance of flies throughout the season. This information can help the grower avoid using insecticides unnecessarily and to properly time any insecticide applications which are used. 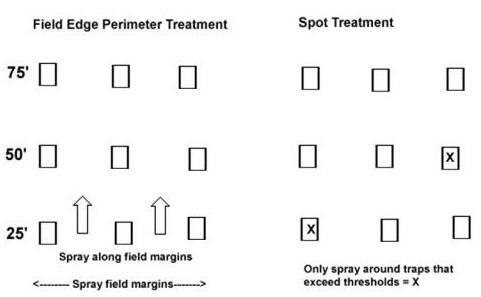 In addition, setting out a grid of traps in a field will allow spot insecticide treatment or a field edge perimeter insecticide treatment to be a management option for the blueberry maggot fly (Figure 9). Research at The University of Maine has shown that an entire field does not have to be treated with an insecticide if it is known where the majority of the fly population resides. In small fields of a few acres or less, setting out a grid of traps throughout the field, one trap about every 50 feet (for a 4 by 4 or 16 trap grid) will allow one to manage the field as 16 sub-units (in this example). When the threshold is exceeded for a particular trap, or on a few traps, only the area 25 feet from the trap or traps that have exceeded the threshold need to be treated with a backpack sprayer. This strategy will only work for small fields since a high density of traps is necessary and frequent (every 2 to 3 days) monitoring of the traps needs to be practiced. A field perimeter treatment can be practiced for larger blueberry fields (Figure 9). As flies colonize a field with ripe berries they travel limited distances (about 10 yards per day) and tend to stay near field edges or weedy portions of fields. Typically, the majority of the fly population remains within 50 feet of the field edge. Therefore, if one sets out a series of trap lines perpendicular to the perimeter of the field (traps at 25, 50, 75, and 150 feet from the field edge), an airblast sprayer can be used for control when thresholds levels of fly captures on the traps are exceeded on the traps 25 feet from the edge. The reason that additional traps are deployed at 50, 75, and 150 feet into the field is to verify that the vast majority of the flies are within the 75 to 80-foot strip that the airblast sprayer will protect.